Do you enjoy using the negative of a die cut sometimes. I certainly do, as you can create a totally different look with it. First of all I cut and embossed the 3 Poinsettias from the white, then I laid the dies on a sheet of red paper with blades facing up. The embossing mat was place on top so they would not cut out the flowers, but left impression of the flowers in the paper. This also slightly embossed them so that I could go over the flower with my stylist leaving a deeper impression. Next, I ran the white paper through the Snowflake embossing folder (you can't do this before cutting or it flattens the embossing). The red flowers were cut with scissors about 1/2 inch away from the edge of the flower and glued under the white cutouts. A pop up dimensional was placed under the large white flower and placed over the red cut out. 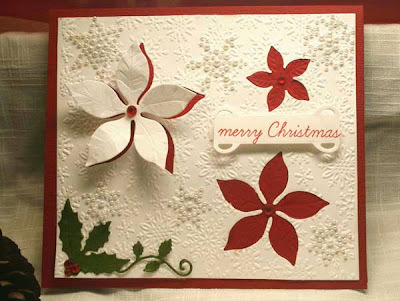 Merry Christmas was stamped and cut out with the Spellbinders die. Marianne pearl snowflakes were placed around the card. I have a new fun product that was introduced to me by Judy Studer when we got together for a fun play day. It is by Art Anthology and is a Dimensional Crystal in a 2 oz bottle containing a high concentration of mica and glitter combination and is permanent on fabric. I have this coming in soon. Pickle (color name) was applied over the Holly Corner die which added a little glitter and deeper color to the card stock. I love that stuff!!! You will have until next Thursday, November 14 morning 6:00 AM EST to link your project. A winner will be chosen from a random drawing for week #45 the winner of the challenge will be announced November 15. This week's winner will receive a Christmas Stamp. Very nice card, Joan! All elements go so well over that beautiful embossed background. You made an delicate card!!! Very pretty Joan, the embossing adds so much to it, I agree, it is so delicate looking....and I just so happen to have a "negative" sitting on my desk right now!